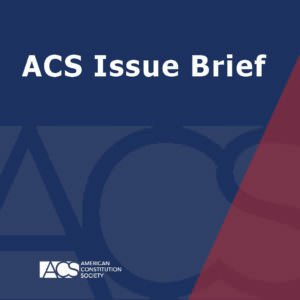 ACS is pleased to distribute “What Process is Due? : A Return to Core Constitutional Principles in Immigration Reform,” an Issue Brief by Aarti Kohli, former Director of Immigration Policy at the Chief Justice Earl Warren Institute at University of California, Berkeley School of Law. Looking ahead to the possibility of immigration reform, Kohli urges the reinsertion of flexibility into our treatment of noncitizens. Among her recommendations, she suggests replacing our mandatory deportation system with a balancing test by which immigration judges can take into account a number of factors when deciding whether to order deportation of an undocumented immigrant. She also recommends reinstating the procedure by which judges in criminal proceedings can issue a recommendation against deportation given the circumstances of the case. “Toward a More Perfect Union: A Progressive Blueprint for the Second Term” is a series of ACS Issue Briefs offering ideas and proposals that we hope the administration will consider in its second term to advance a vision consistent with the progressive themes President Obama raised in his second Inaugural Address. The series should also be useful for those in and outside the ACS network – to help inform and spark discussion and debate on an array of pressing public policy concerns. The series covers a wide range of issue areas, including immigration reform, campaign finance, climate change, criminal justice reform, and judicial nominations. To view the series, click here.